Heat 1 tablespoon oil in large, deep fry pan or stockpot over medium heat. Stir in garlic and bacon and cook 1 to 2 minutes. Remove bacon from pan; hold aside. Rinse any ice glaze from frozen Alaska Cod fillets under cold water; pat dry with paper towel. Brush both sides of fillets with remaining oil. Place fillets in pan and cook, uncovered, over medium-high heat about 3 minutes, until browned. Shake pan occasionally to keep fish from sticking. Turn fillets over and sprinkle with lemon pepper seasoning. Cover pan tightly and reduce heat to medium. Cook an additional 2 to 5 minutes. Cook just until fish is opaque throughout. Remove fillets to platter; keep warm. Add water, spinach and bacon to pot; cover and cook a few minutes, just until spinach is wilted. Stir to blend flavors and heat through. Portion about 1/2 cup spinach blend onto each plate. 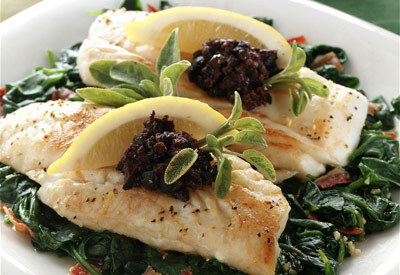 Top with a seafood fillet and 1 tablespoon olives or 1/2 tablespoon tapenade. Substitute Alaska Pollock or Sole for the Alaska Cod. Adjust cook time for fillet size if necessary.